This reproduction in 9 12 size. Print was finished and signed in 2009 and copied using giclée and archival inks and paper. Her card is included in the back wrapping. 1909 Framed The Pink of Condition Lithograph after George Wright. Shipped with USPS Priority Mail. THE PINK PEACH TREE, Vincent Van Gogh Giclee CANVAS PRINT 24x30 in. Artist: Vincent Van Gogh. Title: The Pink Peach Tree. Item #The Pink Peach Tree. The canvas has excellent crack resistance when stretched. Fine art giclée reproduction print on premium canvas. Total Canvas Size: 24 x 30 in. 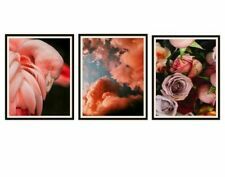 Set of 3 Flamingo Pink Swirls, Roses and Blue Sky Photo Art Print Posters 11x17"
Set of 3 Flamingo Pink Swirls, Roses and Blue Sky Photo Art Print Posters 8x10"
Set of 3 Flamingo Pink Swirls, Roses and Blue Sky Photo Art Print Posters 12x18"
Set of 3 Flamingo Pink Swirls, Roses and Blue Sky Photo Art Print Posters 11x14"
PINK MARILYN MONROE Giclee CANVAS ART PRINT 24x32 in. Title: Tattooed Marilyn Monroe Pink. Item #Tattooed Marilyn Monroe Pink. The canvas has excellent crack resistance when stretched. Fine art giclée reproduction print on premium archival canvas. Total Canvas Size: 24 x 32 in. Print Size Approx: 10x14". Printed on quality coated matte art paper. The Gorge, WA 2009. Print Size Approx: 10x14". Printed on quality coated matte art paper. THE OVER ALL SIZE IS 11" X 8 1/2". THSI SIGNED COPY IS ONE OF SIX PRINTS CREATED ESPECIALLY FOR THE EVENT. Framed and Matted Floral Print Pink Rose Gold Tone Frame 15" x 12.5"
Decorative Framed White Antiques Print -Double Matted Pink Frame -9.5" x 7.75"
A NEVER ENDING GARAGE SALE >>>. Swans Flying over River Thames London Pink Foil Print Wooden Back Framed 12x8"
See ALL 3 photos approx. Artist: Danhui Nai. Pink Gladiola. August, Gladiola. Approx: 19" x 19" square in size. The actual print is 9 1/2 x 7 3/4. Wall art Poster 24"x36" Realfish Gyotaku Series " Fish of the Gulf of Mexico "
Andee Dubin Framed Print Pastel Pink Metal Frame Closet 10 1/4" x 8 1/4"
Andee Dubin Framed Print Pastel Pink Metal Frame Accessories 10 1/4" x 8 1/4"
Canvas art "love life to the fullest and embrace it EMBRACE with no regrets". There is a retractable wall hanger on the back. It is pre-owned and in good condition. Condition - You are purchasing a used item unless it is stated as new. 2, This is canvas print painting, not handmade oil painting. 1, Adopting waterproof polyester thick canvas fabric. 1, This is a five-piece suit. 2, Due to the shooting light difference, the actual painting looks a bit different from the picture color shown on the website, if there is an inconsistency between the image and the actual product, the actual product shall govern. Lovely composition and expertly done. Partial signature shows Benny or Bunny I can't really make it out. This painting will work with many types of decor. Sold as is. "Growing Pains". Learning to deal with thought clutter and angst, she begins her new brightened world and shares through her newest works of Art. It is signed, titled, & dated on the back of the picture. Gig-1992 Cleveland Ohio. Highly Suitable for Framing. The pictures may not reflect the correct colors depending on lighting etc. But I want to make sure you are happy with your item. T L Prevost, artist. Print of flowers; roses, lilacs bouquet.